$9.99Purple Foam Light Up Glow Stick - 18"
You let your daughter pick out what she wants to wear. She's old enough to decide what she likes best, and how she wants to express herself. You tend not to mind what she chooses. But, every now and again she tries to head off to school in a dress without tights, or a tank top with spaghetti straps. You have to explain to her why she can't wear those things to school. But, you try to soften the blow by buying her cute cardigans, and adorable tights. 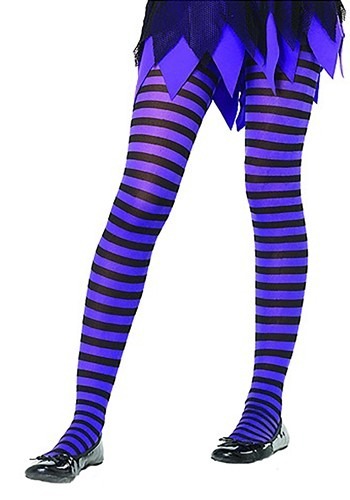 These Kids Black and Purple Striped Tights give her another choice when she gets ready for school in the morning. Pairing her cute dresses with these fashionable sriped tights. She won't have to sacrifice her style to the school dress code, because these tights are stylish and still conforming to policy. You'll be happy. She'll be happy. The school will be happy. All will be well in the world. My 8 year old loves them and they fit her well.